Neha is in shock when she learns that her house will be receiving a guest named Cecelia. Her life flips and all her activities cease, though not completely. What role does this new guest plays in forming or deforming Neha’s life? Will things sort or become more entangled? An appropriate title. Working well with the tale. Giving proper insight to peep in the story. Worked for me in all senses. I loved the hue of the book. Lot of baggages on the trolley are added to show the arrival of someone in full form creating extra spice. A perfect segment is shown. There were characters of vivid characteristics. I met dancers, musicians, actors and singers in the book. I loved the way their lives moved according to the role they were playing. There were many major and minor characters which fitted with the movement of the college phase perfectly. I loved Cecelia the most from the major characters. And from the minor ones, I loved Purti and Mr. Ranade. 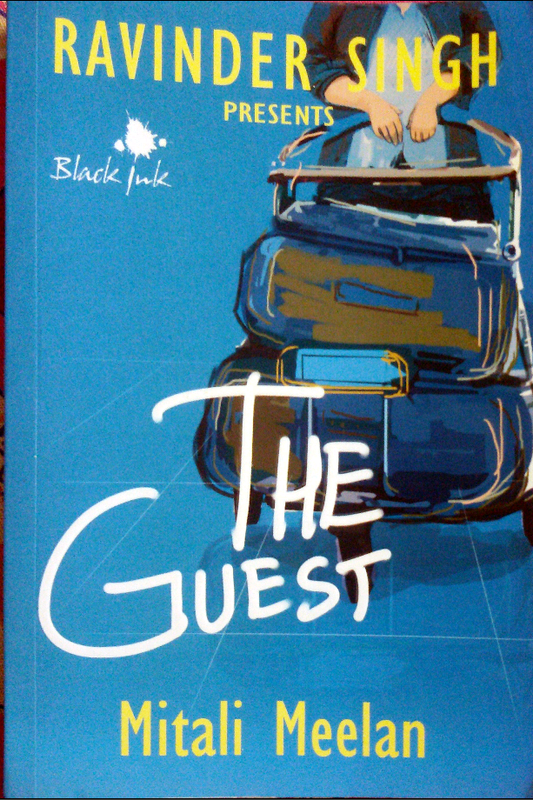 The narration of the book was a first person narrative and thus I could live the life of Neha for some hours. Such was the mood created by the author. I liked the perfect breaks and pick-ups which the author planted. There were no hitches and no flashbacks creating any second thoughts. All in all it worked well. The initial inspection doesn’t give any information about the book and thus I started the book on a very happy note. I was expecting a sort of mystery involved in it. Well, there is mystery but of other kind. From the very start, the book was sorted. There were chapters which had incidents of different order, connecting all the strings. Eye-catchy is the behavioural instincts of various people, a 40 year old and a 17 year old is shown in great depth. I won’t deny that I was losing interest in the book when I reached the middle. But let’s first talk about the starting of the book. Mitali tried her best to build up an essence for a perfect tale. There were easy conversations, many characters and situations were of high interest. But sadly, that was only in the start. The good part is the simplicity and a clear plan of action which was penned by the author. It demands sheer attention and hold on the story by the creator. Further, when I reached around the middle portion, I was highly disheartened because things were moving just for the sake of moving. There was no spark. The incidents were getting mundane too. I have heard all these sort of things on various teenage shows. I found Neha very adamant and repetitive. She too showed the expected traits. If and only if something different would have been planned then maybe there was a hope of an ignition. Nevertheless, I was happy with the end. Books can either leave you speechless or can tickle you somehow. This book comes in the latter section. The ending was nice but again not extra-ordinary. I was enjoying the speeches which were delivered by Cecelia. It was not new but it was nice to look over the matters which not many notice. Summing up- The novel made presence in my mind because of its fluidic language. The aura created by the author around some bunch of students was making me nostalgic. There were few ironical phases in the novel which were impactful. If and only if the story could have been moulded in a less casual way then it would have done wonders of all sorts. Still, I enjoyed the easy going reading experience. · The ironical situations created by the author were great. · I loved the part of story revolving around Purti. · Loved the end. The realizations, the opening of truths and the final segment headed by Cecelia. · The easy flow of language. · Found the story to be a lot familiar. · The pieces were joined properly but they felt a little under-nourished. It can be a light read for beginners, worth a try. Mitali Meelan was born in Thane and brought up in Mumbai. She earned her Bachelor’s degree in Economics and pursued her master’s in English Literature, while working with a magazine as an editorial coordinator for a short while. She has a couple of short stories published in anthologies. When she is not telling stories, you can find her writing blog posts, reading etc.